While we're still reeling from The Force Awakens and anticipating Episode VIII, we've got a completely different Star Wars film to look forward to in the meantime. Rogue One: A Star Wars Story, the first of what we presume to be many stand alone Star Wars Anthology films, hits theaters this December. We know little else about it's story or characters apart from the fact that it will revolve around a group of Rebels stealing the Death Star plans, thus leading into Episode IV: A New Hope. 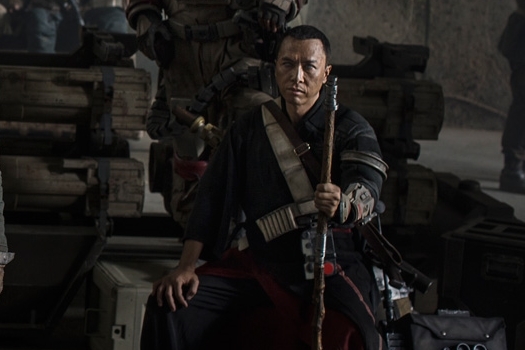 Just recently one of the stars of Rogue One, Donnie Yen, spoke with USA Today about his newest film IP Man 3 and briefly spoke about his role in Rogue One. "Yen already is ensconced in the Star Wars cone of secrecy. All he’ll spill is that his character “is definitely an important guy," he had fun doing it and “I will get some action."" Yen's character has inspired much speculation since being revealed in the cast photo released at last year's D23 expo. He appears to be blind and his clothing and gear seem to invoke the Japanese Samurai, which initially inspired George Lucas to create the Jedi. Rogue One is said to focus on characters that are not Jedi, so Yen's character could be some type of other Force user, or simply a skilled physical fighter, thus putting that actor's martial arts expertise on display. Donnie Yen will star alongside Felicity Jones, Diego Luna, Mads Mikkelsen and others. Rogue One: A Star Wars Story opens in theaters on December 16th.